This Sterilite pencil box (Sterilite 1723) is a plastic pencil box with a translucent blue lid and a clear base. Because these plastic pencil boxes have a clear base, you can ensure you will find the items you need quickly. These plastic pencil boxes for kids also work as crayon boxes or for craft storage containers. Each of these school pencil boxes feature a hinged lid that flips up for easy access. Store pencils, pens, scissors, erasers, glue and more in these Sterilite pencil boxes. 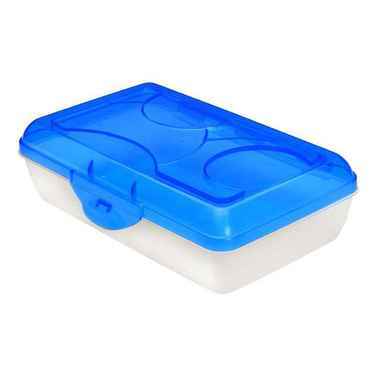 Many organizations choose to provide a plastic school box for classroom use to be used again the following year. Available in a set of 12, the Sterilite pencil box can get you ready for the next semester. The Sterilite pencil box wholesale approach allows you to save for other important supplies.